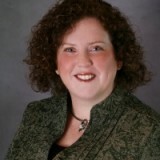 Note from PCJ Editor Wayne Senville: Our Summer 2011 issue includes a short, but quite interesting article by PCJ contributing writer Della Rucker on why some comprehensive plans seem to fall flat after they're adopted. 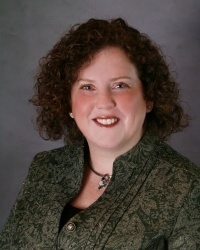 Given the interest of many PCJ readers in comprehensive plans and the process of getting them adopted, I asked Rucker if I could ask her some follow up questions. In your recent article, "Why Comprehensive Plans Gather Dust," you focus on a topic that I’d guess most planning commissioners have wrestled with -- how to make sure their city or town’s comprehensive plan actually gets used and is meaningful to the community. You then outline some of the elements that you feel are vital if a plan is to be useful: using data to understand the most important issue the community will be facing; having meaningful public participation; setting priorities; and focusing on what’s necessary to get the plan implemented. It’s this part of your article that I’d like to explore further with you. I also want to get your reaction to some of the many comments we received on our Linkedin group page about the first draft of your column. One of the points you make, as I noted, is the need to have “meaningful public participation.” In your column you say that we have “to do more than let the public spout” and that those participating in the planning process need to have “real-world challenges to grapple with, so that the feedback you get has meaning.” Can you flesh that out a bit? One of the biggest sleeper challenges we are facing today is that our traditional public debate model of public involvement isn’t working well and has probably outlived its usefulness. I think there are at least three reasons for that. 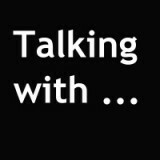 First, today we have a lot more voices and a wider range of them. Moreover, not everyone can express themselves adequately with the traditional “stand-up-and-make a speech” approach (that is, go up to the podium, and make your comments in three minutes or less). So we get silence from a large part of the population, and often less than ennobling wisdom from the small number who do stand up to speak. The second reason is that the issues we have to grapple with have become much more complicated because of the interdependencies and interrelationships that we live with in a modern community. You can’t deal with too much complexity, address too many nuances, and acknowledge that there may not be a perfect solution when you are at a podium for a couple of minutes and the situation has been cast as a for-or-against debate. The third issue is that the ways in which we gain understanding and grapple with decisions are changing -- and, I would argue, need to change ASAP. K-12 educational methods (how teachers are being taught to teach) have largely discarded the lecture as a useful means of building knowledge. Instead, teachers are shifting to methods that engage the students directly in dealing with information and making sense out of it for themselves. This allows students to develop better and more meaningful solutions to the problems they are presented. The more we become used to living in a world rich with information of all types, the more we need to be able to do more than parrot back what we hear. What does educational methodology have to do with public participation? I’d argue, everything. 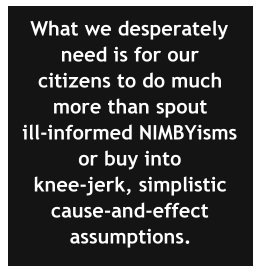 What we desperately need is for our citizens to do much more than spout ill-informed NIMBYisms or buy into knee-jerk, simplistic cause-and-effect assumptions. We need to get people reasonably up-to-speed on the issues, and engage them in the search for solutions -- solutions that are realistic and address the complexities and ambiguities of real community life. The corporate world certainly recognizes this. Companies are putting massive amounts of effort into broadening their employee base to include the widest range of people possible and then creating team environments to work on solving complex challenges. If they’re finding it necessary to use diverse team problem-solving to deal with stuff like getting shampoo into a bottle, how much more do we desperately need real, deep involvement to deal with the massive complexities that make up a community? leads them to the creation of something that has value to the community (making the time and effort they spent worthwhile). The tools to do this are out there -- we just have to learn them and use them. Getting Beyond the "Usual Suspects"
We also all know that planners and planning commissioners often struggle with getting more than “the usual suspects” to participate. Are there strategies you’ve found that can help better engage more members of the community? I can think of three different broad categories of “not the usual suspects,” and each of them will need a different strategy. 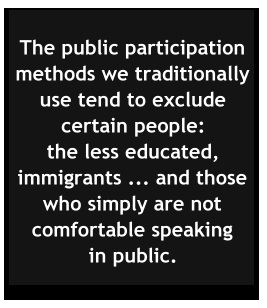 First, the public participation methods we traditionally use tend to exclude certain people: the less educated, immigrants (especially when language and cultural barriers exist), and those who simply are not comfortable speaking in public. Again, the need to include them isn’t because it’s the “right” thing to do -- it’s because these people have a particular knowledge of the community that we will never be able to access if they don’t share it with us. If we remain blind to those issues, we’ll miss the opportunities to address them. I’ve done public involvement sessions co-led with a trusted community translator or liaison to draw out participation from immigrant communities. If there is any expectation of persons who are illiterate or disabled, I make sure that people will be available to help those who have trouble reading or writing -- and that this is clearly mentioned in the information that goes out before the event. I’ll often also station a person at a table to write down comments or ideas that anyone has. That helps not only people who cannot write and elderly people who have trouble seeing, but it also helps people who would rather just explain their ideas out loud. How would you respond to this? Does it make sense to have both a highly detailed and a condensed version of the comp plan? Or does that create more confusion? I have done a lot of plans that had a recommendation document and a companion information document. You definitely need to understand where you have been and where you are today, and if it makes sense to have two volumes, or an Executive Summary and an exhaustive version, great. Just make sure the covers show that clearly and that you indicate that there’s another version available. The point I made in the article, however, was that I see a lot of plans that are 95 percent Encyclopedia, and maybe 5 percent recommendations if you’re lucky. You end up knowing a ton about the community’s past and present, which is of course valuable, but you have very little guidance about the direction and priorities for the future. I spent part of my early career as a public historian, so I am a complete junkie for community histories, but knowing the past is just a small piece of what you need to shape the future. In a lot of cases, I think that a plan that is entirely Encyclopedia (lots of facts, not much recommendations) is the result of a situation where no one involved had the power or the willpower to stick their neck out and assert a vision of the future and how to get there. So you write a lot of pages on the stuff that’s not controversial. And as I indicated, as a consultant, I’ve been guilty of that myself. We also received some comments about the political nature of developing a comp plan. One commenter, for example, wrote: “Great article, but where do politics fall in this?” I know it’s something you didn’t really have space to delve into in your column -- and, in fact, we’ve devoted three past articles in the Planning Commissioners Journal just to the topic of “the politics” of planning. But I’d still be interested in hearing your thoughts on the role of local elected officials in developing the comp plan. Should they just stay out of the process till a recommended plan is forwarded to them by the planning commission, or is it important to involve them earlier on? And related to this, how can a planning commission effectively identify priorities -- as you recommend -- unless they know what’s likely to receive funding from local elected officials? Elected officials really should be involved during the planning process. I have seen a lot of situations where the elected official said “oh, we don’t want to be involved, we don’t want to influence the process,” but then they had heartburn over some of the recommendations and didn’t want to approve it. Not only is that ineffective, but it’s incredibly bad press. On the other hand, though, local elected leaders cannot appear to be running the process or overly influencing it, or that will set the plan up to be ruled arbitrary and capricious. Like I said about all the rest of the citizens, elected officials have specific knowledge that is critical to a useful plan. They tend to know details of government operation, budgeting and funding issues, and other items without which, the plan would lack an important grounding in reality. So they need to be involved. But they need to be prevented from dominating the conversation, or their insider’s perspective may blind the plan to issues and opportunities that the insider can’t see. Managing that process requires very strong leadership from the planners. That can be done, even if the elected person is the planner’s boss, but it again requires a process that decentralizes the process, treats all the participants as equals, and avoids the soapbox model (most elected officials can run circles around other citizens when it comes to making speeches). But if we make sure that the elected officials have ample opportunity to hear and work with other citizens, chances are they will become profound supporters of the plan because they understand that its’ objectives and impetus is coming from citizens grappling honestly with real issues. 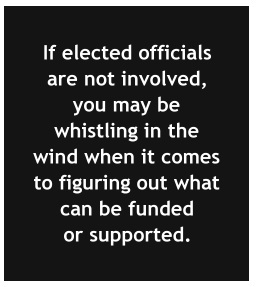 The same balancing act applies to your related question about the need for planners to involve elected officials -- if elected officials are not involved, you may be whistling in the wind when it comes to figuring out what can be funded or supported. Much better to have their perspective in the mix while you are still working on the plan than to have to throw out an important idea after doing all the work on it. However, don’t let the funding question completely dominate the decision. As people, and especially as planning commission members and elected officials, we tend to have very short-term and narrow perspectives: if I don’t immediately know how to fund it, it must not be fundable. What we often fail to realize is that there are many more potential funding sources for any initiative than simply the three or four we are used to using. If an idea is important to the community, you can often find a way to fund it. t might take some work, and there may be tradeoffs, but on the fundamental level, it can be done. So don’t toss out a potential recommendation on the basis of “how will we pay for it?” Make figuring out how to pay for it part of the implementation. 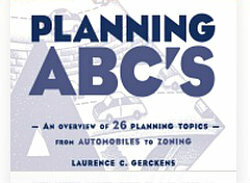 Editor's Note to PlannersWeb members: for summaries of the many articles on the comp planning process we've published (you can then download whichever articles you want to read).